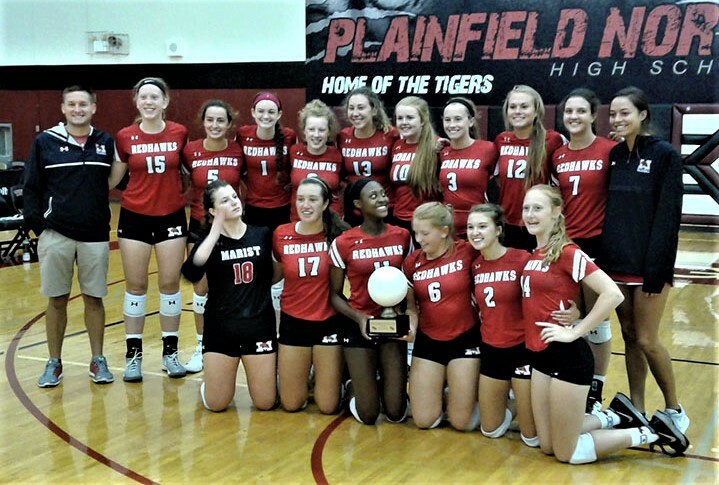 Marist will begin its Class 4A title defense next weekend at the Illprepvb.com Crosstown Showdown hosted by Plainfield North and Plainfield Central. Last season’s highlights: 26-4 overall, 7-0 in conference, lost 25-19, 22-25, 25-17 to Bismarck Henning Rossville Alvin in a Class 2A regional semifinal. Top returnees: Outside hitter Taylor Powell, setter Marissa Herschberger. Last season’s highlights: 24-13 overall, 13-0 in conference (conference champions), lost 25-16, 25-20 to eventual state champion Marist in a Class 4A regional final. Top returnees: 5-10 junior and third-year starter Amy Schwem (54 aces, 51 kills, 716 assists, 171 digs), 6-0 sophomore rightside hitter Amanda Rice ​(144 kills, 34 digs, 28 blocks), 5-10 junior outside hitter Ella Pelen (27 aces, 62 kills, 61 digs), 5-7 junior libero/defensive specialist Lea Gaetto​ (27 aces, 72 kills, 120 digs). Top newcomers: 5-9 junior outside hitter Nicole Komendant, 5-9 sophomore outside hitter Hannah Niklewicz. Outlook: Lemont may be young, but Schwem and Rice have a wealth of experience both on the varsity level and in club. They should be able to carry Lemont to another conference championship and a long run in the state tournament. Last season’s highlights: 41-1 overall, 8-0 in conference (conference champions), won Plainfield North tournament, won Wheaton Classic, won Asics Challenge, won Michelle Smith Catholic Classic, defeated Minooka 22-25, 25-22, 25-15 to win Class 4A state championship. Top returnees: 5-10 senior middle hitter Abby Callahan (148 kills, 42 blocks in 2017), 6-1 senior middle hitter and Grand Valley State recruit Mattie McCabe (46 kills, 32 blocks), 6-2 junior rightside hitter and Clemson recruit Camryn Hannah (198 kills, 88 blocks). Top newcomers: 5-10 junior outside hitter Maddie Arundel, 5-11 junior outside hitter Avery Jedry, 5-7 junior libero Mairead Boyle. Outlook: Despite losing several key seniors, Marist had a very talented bench in 2017 and was unbeaten at every lower level. The pipeline continues and the RedHawks will not experience much of a drop-off under Vidovic, who was 30-9 during his first season in 2016. Last season’s highlights: 16-13 overall, finished third in conference, lost 20-25, 25-16, 25-21 to Oswego in a Class 4A regional quarterfinal. Top returnees: 5-7 senior libero Juliana Seno, 5-8 senior middle hitter Alena Grabavoy, 6-0 junior middle hitter Kiley Mitchell. Top newcomers: 5-7 sophomore setter Simone Schurr. Outlook: Oswego East faces an uphill climb in the Southwest Prairie where Plainfield Central and defending state runner-up Minooka rate as favorites. Last season’s highlights: 22-14 overall, 7-0 in conference, lost 25-13, 25-20 to Teutopolis in a Class 2A regional semifinal. Top returnees: 5-8 senior middle hitter Elizabeth Bowye (259 kills, 31 aces, 60 blocks, 61 digs), 5-9 senior middle hitter Morgan Parsons 104 kills, 36 blocks, 32 digs), 5-7 senior rightside hitter Gabi Pierce (120 kills, 15 blocks, 90 digs), 5-7 senior outside hitter Lauren Russell (214 kills, 40 aces, 14 blocks, 449 digs). Top newcomers: 5-10 rightside/middle hitter Madi Cisna, 5-11 rightside/outside hitter Kyleigh Marty, 5-3 libero Kya McConnell, 5-7 setter/rightside hitter Chloe Watson. Outlook: The Rams are looking to get back to Normal for the second time in four years after finishing fourth in 2015.Shelbyville certainly has the firepower to get it done.But teams like Newton and Teutopolis figure to stand in the way.